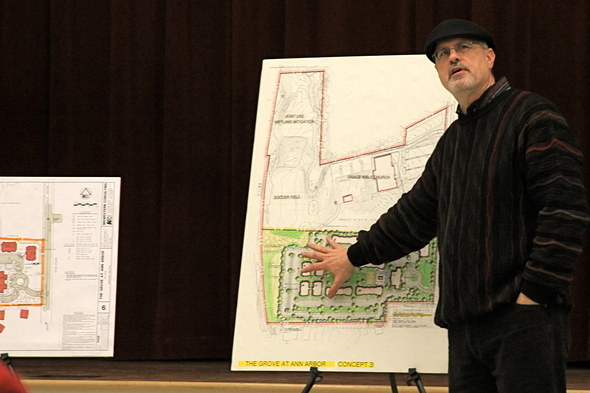 Brad Moore, local architect from J Bradley Moore & Associates, shows the site plans to attendees of a public feedback meeting for The Grove at Dickens Elementary School. More than 60 Ann Arbor residents expressed their concerns about a proposed student housing project on the city's west side at a public meeting Wednesday. 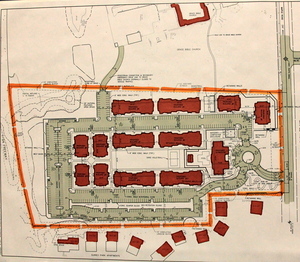 The student housing project, called The Grove, would be located on a 15-acre site just south of Grace Bible Church off South Maple Road near Pauline Boulevard. North Carolina-based developer Campus Crest Communities is proposing 10 to 12 three-story apartment buildings, totaling about 224 units with two or three bedrooms. It includes 600 parking spaces- one per bed. That’s too many college students for their quiet residential area, said several attendees, especially considering its distance from the University of Michigan campus. One concern raised by several community members was the potential failure of the project. One attendee asked Chris Russ, vice president of development for the company, what would happen if students simply don’t take residence at The Grove. Russ said Campus Crest Communities has more than 30 locations nationwide, and the average occupancy rate is above 90 percent. A plan for The Grove shows the general layout of the site, with the Grace Bible Church building to the north. Earl Ophoff, a project manager at Midwestern Consulting, also responded to the question, saying at “worst-case” the buildings would be suitable to more than student housing, but it won’t be something that needs consideration. Another voice in the group asked what the purpose of the meeting was for, and if Campus Crest Communities has had enough opposition elsewhere to cease a project. Russ said there haven’t been any changes to the plans since the Jan. 19 public meeting, and would need to review the current plans and public comment if any changes are to be made. Other concerns echoed those of the last meeting: storm water management, water pressure issues, traffic and transportation, home values and crime and safety issues. Not all anger was aimed at the site developers; one attendee said she is very disappointed with Grace Bible Church for listing the 15-acre parcel for sale. The next step for the developers is to compile a report of the public feedback from the two meetings and include it in the proposal for the Ann Arbor Planning Commission. Russ said they hope to have the final site plans to the AAPC within the next month. Sat, Feb 11, 2012 : 7:37 p.m. I think it's a reasonable location for student housing to bypass the high cost of downtown properties. Everybody complains about the high cost of tuition and when steps are taken to keep the costs down, it's a &quot;not in my backyard&quot; fight. Neighbors are angry with the church for putting the property up for sale? Wow, I thought it was a free country. Unless there is zoning issue these neighbors need to back off because if it wasn't for the U of M, Ann Arbor would would become a &quot;an assisted living facility&quot;. Fri, Feb 10, 2012 : 11:33 a.m. I find the accusations of NIMBYism to be weak arguments. What are residents supposed to do when a proposed development clearly does not fit with the surrounding land uses, and would so obviously harm the quality of life for neighbors? Should people just be willing to allow any thing, any time, any place? I have no doubt the neighbors would welcome a reasonable development. But Grace Bible Church and this truly awful developer only care about one thing: maximizing their own profit, even if it places costs and burdens on their neighbors. To hell with that. So if the best you can say is the neighbors are NIMBY's, then I say 'cool story bro, you should tell it more often'. In other words, that's just weak. I find interesting all the favorable comments regarding the building of housing on Maple north of Miller. Must not be in the same neighborhood as the people submitting comments here. Really an outrageous case of liberal NIMBY. Thu, Feb 9, 2012 : 11:45 p.m. Kudos to the developer for reaching out to public. Thu, Feb 9, 2012 : 11:21 p.m.
No, there aren't that many students who would want to live there. Not the ones who attend the UM, anyway. What's the track record for cheaply built three story apartment buildings that back up to freeways? How are the ones that line parts of our local freeways doing? How do they look to you? Thu, Feb 9, 2012 : 10:53 p.m.
At MSU they have multiple apartment complexes like this (Chandler's Crossing for example): 3-5 miles away from campus, include the pool/volleyball court/coffee shop etc., and all are really successful. At least, they keep building more of them so I assume they're successful. Thu, Feb 9, 2012 : 11:52 p.m.
No idea on crime stats for the huge complexes.... but in the summertime the pools became like MTV spring break for students that stuck around for summer classes. Thu, Feb 9, 2012 : 11:24 p.m.
Do you mean the really big complexes in E Lansing that sometimes make the 11:00 news for drunken riots? What are the crime stats for those huge complexes? Thu, Feb 9, 2012 : 9:04 p.m.
My primary problem is when an out-of-state developer thinks that they know an area better than the locals. Especially when they say things like they want to put in &quot;resort-like amenities&quot; -- that sandlot volleyball will be great in January, I bet . I think these developers are looking at schools with students that have a larger commuter population than UM. On top of that, parking on campus is really, really, tight right now. Students that want to park in outlying commuter lots would be better off just taking the bus. If they studied the demographics, they would realize that their biggest customer base might just be young professionals that want to live within Ann Arbor, and can't afford the &quot;student&quot; luxury high-rises going up. Based upon what I have read online about these developers, they have a spotty record, at best. At worst, they come off as rip-off artists. That might be a good spot for family housing, or couples with no kids, or young singles. However, I just do not see how undergraduates would want to live that far from campus. It's funny how all the NIMBYs show up to this meeting only to get completely shot down. Sorry NIMBYs, but screaming &quot;We don't want you here!&quot; at the top of your lungs won't do a darn thing. They're going to develop that land, like it or not. Thu, Feb 9, 2012 : 11:26 p.m. I bet that the developer has to make tons of changes and they run out of money before that land gets developed. Thu, Feb 9, 2012 : 7:25 p.m.
Am I missing something? You put potentially 600 75th-percentile+ students this far from campus, and I would think that the most popular mode of transportation to the campus is their car. Just where is UofM going to find hundreds more parking places on campus? Maybe a bus would used by some, if it was frequent enough and provided service into the night (weekends too), but I would think that cars would be the most popular option. Expanding the tax base sounds good to me, especially since its not my neighborhood, but how do they handle transportation? Thu, Feb 9, 2012 : 8:03 p.m.
Maybe they can rent spaces in the new underground garage closer to campus?! Thu, Feb 9, 2012 : 6:59 p.m. I completely agree with the majority of concerns. Not only will a project like this encourage homeowners to move further and further away from Ann Arbor, but it will throw off the suburban/urban balance balance that makes Ann Arbor such a wonderful place to live. West side Ann Arbor is refreshing break from the hustle and bustle of downtown, and although this project is slated for students, I have serious doubts about the financial success of the project especially considering the current state of our economy, university tuition hikes, more students going out of state etc. Beyond that I think this would be a far greater attraction to individuals from neighboring communities then from students, the majority of whom would never even consider living this far from campus. With the exception of a handful of graduate students, most do not have cars, and while many use the bus, it simply is not a practical location for student housing. Beyond that, there has been significant difficulties in all types of related projects and many have gone bankrupt, passed off to other property developers, or simply sit vacant. I hope the city council considers this issue as it will detrimentally affect the quite town/urban town split that makes ann arbor such a wonderful place to live. Thu, Feb 9, 2012 : 8:44 p.m. The irony of your &quot;more students going out of state&quot; when you consider the U attracts a high portion of students from out of state. What difficulties in related projects? Examples? Thu, Feb 9, 2012 : 6:20 p.m. Typical Ann Arbor. Put on the front of being liberal, progressive and all inclusive until it affects you. Thu, Feb 9, 2012 : 5:22 p.m. The City should request a copy the market study completed for this project to support the argument for &quot;student housing&quot; not family, not senior but actual student housing. It is highly unlikely that college students would be willing to live this far off of campus. This is not a realistic option given the cost of parking near the University. This may be a better suited for graduate students but even this market is limited. It is inconceivable to think there is even a market for student housing on the west side of Ann Arbor. This sounds like a poor attempt at &quot;built it and they will come&quot; approach to development. This is a real stinker of a proposal from an out of state developer. Thu, Feb 9, 2012 : 5:18 p.m.
@Danny Shaw: What is the zoning for this property? Does this development conform to the current zoning....or, is this a PUD? Thu, Feb 9, 2012 : 5:20 p.m. The property is currently zoned for multi-family use. We're checking whether this project would be a planned unit development. It seems like a big old case of N-I-M-B-Y syndrome to me. People should stop complaining about economic development and get over it. Otherwise, if the neighborhood is no longer desirable to them, they should move. If the people building the place think they can make money building it there - more power to 'em. Thu, Feb 9, 2012 : 7:33 p.m. This is the same neighborhood that objected to development in what is now &quot;Dicken Woods&quot; (and what might have been a library branch had the negotiations been open instead of secret). The city parks and/or NAP opposed that becoming a park because it was full of junk trees and invasives. On the positive side, the neighbors have put a lot of work into their woods! Thu, Feb 9, 2012 : 4:30 p.m. I am sure they will build a nice complex and everyone will be happy. Thu, Feb 9, 2012 : 4:28 p.m.
What are you afraid of? They have every right to build this. Thu, Feb 9, 2012 : 4:01 p.m.
Thu, Feb 9, 2012 : 3:08 p.m.
Thu, Feb 9, 2012 : 2:56 p.m. Sounds like the project/development should be called &quot;Cedar Ridge East&quot;. I sure hope the bonfire pit is large enough to accommodate a davenport. Thu, Feb 9, 2012 : 6:12 p.m.
Not a great place for students, but young professionals would be a welcome sight in this area. Thu, Feb 9, 2012 : 2:27 p.m.
To be fair, nothing is &quot;student housing&quot;. Fair housing in Ann Arbor dictates that it's illegal to discriminate for or against someone based on source of income. If you market your place as &quot;student housing,&quot; you're violating fair housing. I imagine the developers know this and wouldn't call it student housing--that's probably something the neighbors call it due to their fears. Also, as someone that once was a UMich student, for most undergrads, the primary criteria for an apartment is &quot;can I walk to campus?&quot; and you definitely can't do that from there. Thu, Feb 9, 2012 : 6:04 p.m. The developers call it &quot;student housing&quot; because they intend to market it to students. Students will pay a higher per bed price than others so a 2 bed apartment can go for a higher rent than it might in other areas. However, when asked about fair housing, the developers said that they could not decline someone because they were not a student. So student housing, in this case, means the targeted market demographic (and the developers may or may not provide a campus shuttle). You're right .... anyone could rent there. And I agree, while it might give a student environment (if they are all students), it would not satisfy students who want to walk to campus. Thu, Feb 9, 2012 : 4 p.m. Yes, one primary criteria is often &quot;can I walk to class&quot;, but another one is &quot;can I afford it&quot; and another is &quot;will I actually enjoy living here&quot;. I would have loved one of those Zargon Place apartments when I was a student, but it definitely wasn't in my price range. I lived within walking distance of campus and paid $350/month, but the house I lived in was kind of a wreck, in retrospect. Thu, Feb 9, 2012 : 3:11 p.m. This is racism thinly veiled. Anyone familiar with that area knows full well a majority of those apartments on south maple are occupied by a large percentage of low income non white personnel. It has nothing to do with students like you have said. Thu, Feb 9, 2012 : 2:10 p.m.
&quot;The compounds offer "resort-style amenities," such as a large pool, sand volleyball courts, basketball court, barbeque pits, game room, bistro eating area, coffee bar, library, fitness center, in-room washer and dryer and fully furnished apartment units.&quot; Things have certainly changed since many of us went to school. Anyone who complains about the high cost of education should factor in the expense of these types of residences. Nothing wrong with it obviously - just an observation. Fri, Feb 10, 2012 : 11:54 a.m.
And students pay for it with private funds, so your point is? Thu, Feb 9, 2012 : 2:09 p.m.
Fri, Feb 10, 2012 : 3:24 a.m. I could not connect to any of your links. All had error messages. Thu, Feb 9, 2012 : 2:05 p.m. Personally, I don't believe many students would want to live here, because it's not &quot;part of the campus environment.&quot; That said, as for the argument about &quot;proximity to amenities&quot;, it's actually a pretty good spot. It's walking distance to the post office, bike store, banks, hardware stores, grocery stores, restaurants, and many other retail establishments. It's a fairly short 2 mile commute to campus on a bike. It's well connected by public transit, and the developer is promising to run shuttles a well. As for the greenbelt argument, the whole point was to drive density inside the city limits and keep the land outside the city limits rural. This definitely falls within that goal. When all is said and done, it's private property and as long as it conforms to zoning, it's the developer's right to build it. Thu, Feb 9, 2012 : 2:01 p.m.
Thu, Feb 9, 2012 : 1:50 p.m.
Opposition to this is unwarranted. This group has been successful and has a proven track record. I would much rather have this than more public and low income housing in this area. Thu, Feb 9, 2012 : 5:07 p.m. According to Campus Crest Communities location map, they do not have properties located in Bloomington, IN so I am not sure to which project you are referring a2roots. Also, I am not sure by what measure you evaluate success. Do you mean fiscal success because to be honest, that was not the concern of the citizens who attended the meeting last night. People were concerned about what was going to happen to their neighborhoods and quality of life as well as the viability of the project. I know Bton very well - even if there was a project there, demographically, it is a very different community. Thu, Feb 9, 2012 : 3:39 p.m. @ypsi...I am familiar with their project in Bloomington, IN. Further away and a desired living spot. These apartments could easily be adapted to the general public. Based on development cost it would be unlikely that these units would ever be considered viable for persons of lower income. The city of course will probably dictate a certain number be set aside but it is possible that students could qualify. @peter...you must be unfamiliar with Ann Arbor. This section of the city has a disproportionate number of public housing and low income housing units. As a homeowner I would rather see units that do not negatively impact my homes value. Whether you understand or not your so called &quot;poors&quot; do that. Thu, Feb 9, 2012 : 2:16 p.m.
Yeah, I mean, who wants poors in the neighborhood! Thu, Feb 9, 2012 : 2:15 p.m. But A2, what do you think will happen if these apartments do not generate interest from College Students? Will they sit empty, or will they be made available to other groups of people, like low income? It's an all around terrible idea. Thu, Feb 9, 2012 : 1:22 p.m.
Fri, Feb 10, 2012 : 11:51 a.m.
Clearly there is high demand for student apartments. Several older dorms are closing, other newer apartments have very high occupancy rates, student admissions have grown increasingly larger, etc. Thu, Feb 9, 2012 : 12:50 p.m. It's just a really dumb idea by a less than stellar developer. Students don't want to live next to a freeway, miles from campus activities! Parking at the site and downtown would be a huge challenge. Other than that, a great idea! Thu, Feb 9, 2012 : 12:49 p.m. Step back from this project, and from the previous iteration of development for this property. What about the site makes high-density residential an attractive development option? It isn't proximity to amenities, transportation, or jobs. In fact, because it backs up to the Interstate, the ambient noise to the residents will probably be fairly high. But the City is likely to favor it for one simple reason: this is currently tax-exempt (owned by a church) property which will be converted to taxable and developed at a high-density and therefore high taxable value basis. It is, as usual, about the money. Isn't this the sort of development we have a Greenbelt specifically to prevent? Or is that only outside of the City limits, where the bottom line of tax revenue won't be impacted? Thu, Feb 9, 2012 : 5:19 p.m.
Lol @Jake C...that will be a good thing then for those neighborhoods! The highway noise can be pretty intense over there, and at least now the formerly 'family' areas will be grateful for the low roar of trucks and cars speeding by, to drown out the distinct sounds of partying! Thu, Feb 9, 2012 : 3:56 p.m.
For high-density residential areas, ambient noise (like from the highway) can often be a good thing. If it's 1 AM, would you prefer to listen to your rowdy neighbors partying down the hallway, or the white noise of trucks driving down the highway? Thu, Feb 9, 2012 : 12:34 p.m.
That seems like a pretty remote location for student housing. Are that many students going to want to live that far away from campus for that high a rent? Thu, Feb 9, 2012 : 8:39 p.m. The developer states right in the article their other properties average 90% occupancy. Again, as the developer states, they would not risk this kind of money if they didn't think it would work out. Thu, Feb 9, 2012 : 7:28 p.m. There's a bus line right there, and students are already living in the apartments along Pauline. When I was in grad school at UM, I knew students who were living in Ypsilanti - this would be close by comparison! Thu, Feb 9, 2012 : 5:35 p.m.
Thu, Feb 9, 2012 : 2:49 p.m.
MrA2 - Please don't forget that POTUS is going to reduce U of M tuition and associated expenses so students (really parents) will now have more disposable income for rent, food, beer, gas, condoms, etc. This could be an economic game changer to the community? Thu, Feb 9, 2012 : 11:56 a.m. Developers should also work with AATA and encourage renters to use bus to get downtown to classes. Where would 400 of 600 cars be able to park downtown? Thu, Feb 9, 2012 : 3:25 p.m.
AATA runs buses through that street, so bus transportation to campus or downtown shouldn't be a major issue. If enough students take the bus at peak times, AATA generally adds additional buses around those times. Thu, Feb 9, 2012 : 11:38 a.m.
No apartments for an out-of-state developer. Keep that area natural and left to an in-state developer. Thu, Feb 9, 2012 : 11:13 a.m.
Maybe, just for fun, AnnArbor.com could possibly report on projects this developer has done in other states in the past? Why is this lacking from your coverage? It would be a good indicator of what kind of company this is and what we can expect if this project goes through. Thu, Feb 9, 2012 : 5:17 p.m.
Maybe articles about complaints of this company also? Thu, Feb 9, 2012 : 1:59 p.m.
Actually it's in the article. Click on Campus Crest Communities in the article to get to their web site. They have lots of properties and quite a few under construction this year. This company may be spreading themselves too thin?